Aaron Jonah Lewis is a multi-instrumentalist, composer, educator and performer. 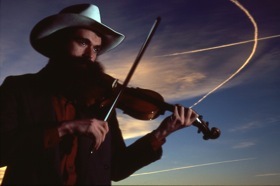 On stage he is best known for his fiddle playing with The Hot Seats, and he has won awards at the Clifftop Appalachian String Band Festival and at the Galax Old Fiddlers Convention, including First Place Bluegrass Fiddle in 2007. He started playing classical violin at a young age and studied at Interlochen Arts Academy before going on to obtain a BA in Human Ecology from College of the Atlantic, Maine. One of the major focuses of his time there was his specialization in sound art culminating in the conception, production and distribution of "Sounds of Mount Desert Island" which can be found at www.aaronjonahlewis.com. He has most recently been living in New York where he was working as a freelance teacher and musician.